This is just a snippet of a food memory from the time when I was growing up in Oklahoma—a flashback really. It is morning sometime in early June and Grandma Anderson (my mother’s mother) is busy in her kitchen putting together Strawberry Shortcake for the picnic that we will have later in the day at the cemetery, and I am “helping” her. I watch Grandma, as she slices up the pile of strawberries that we just finished picking from her garden. The strawberries are the kind that are sweet and juicy and red all the way through, the kind you just can’t resist, as I pop one into my mouth. She mashes some of them up with a fork, sprinkles on some sugar, and stirs them around to make a chunky sauce. Next, she whips some cold, very thick heavy cream and places it in the icebox. 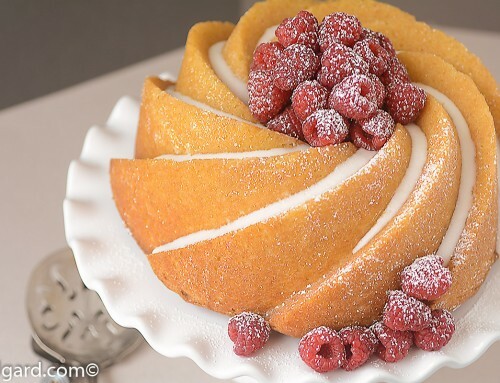 The cake, birthday-cake size, has been baked to a light golden brown, and as Grandma slices it in half horizontally, I see that inside, it is creamy white, trying to be a yellow cake. 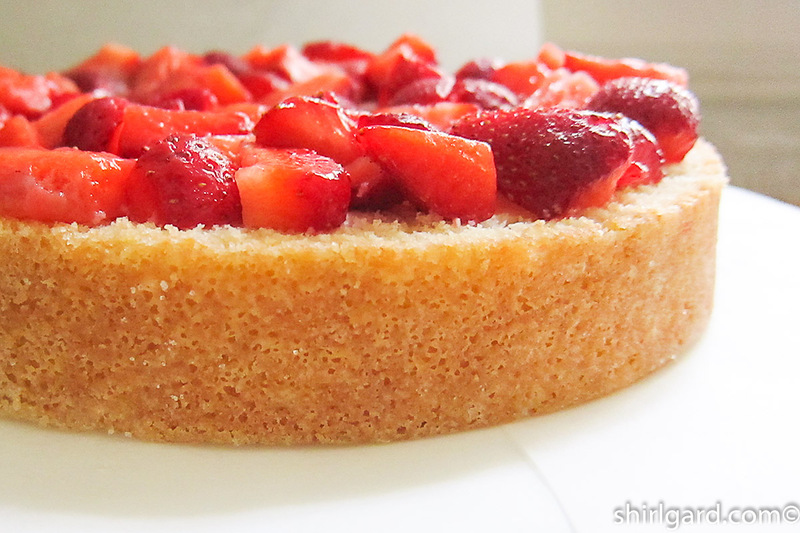 She places the bottom half on a platter and begins to cover it with the sliced strawberries. As she spreads them around, a few fall onto the platter, but this doesn’t seem to bother her; she just keeps going. She takes a big spoon and starts plopping down the chunky sauce, covering all of the sliced berries. 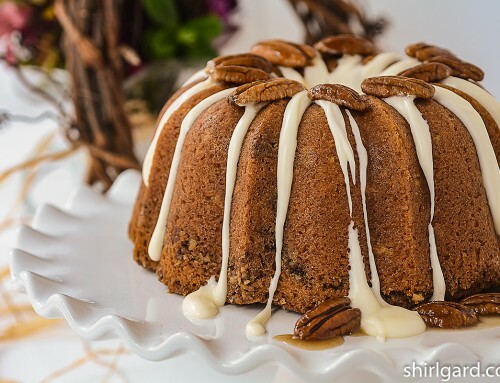 Some of the sauce falls on the plate too, but much of it is beginning to soak into the cake. 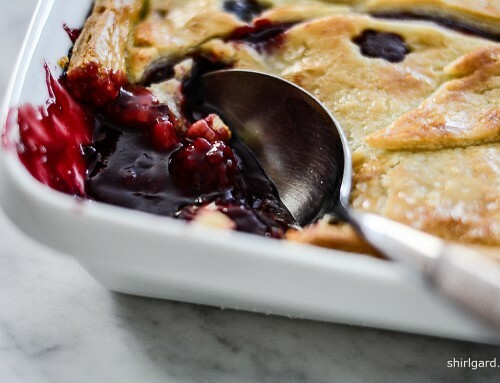 Before putting on the top layer of cake, Grandma spreads a thick layer of whipped cream over the berries, and drizzles it with a little more of the mashed berry sauce. On goes the top layer of cake with more whipped cream, more berries, and more sauce dribbling down the sides. I think it looks so pretty. When the cake is done, we are off to the cemetery, for it is Decoration Day at Gideon Cemetery (near Tahlequah, OK), knowing that it will be good and soggy with strawberry juice—and delicious—by the time we are ready for the picnic. At the cemetery, some family members busy themselves with putting flowers on the graves, peonies from Grandma’s yard (and, of course, I’ve always pronounced this word the same way Grandma did: pē-ŌN-ēs). Others start laying out all of the potluck food that people have brought (yes, there are picnic tables in the cemetery). The mood is somber and festive at the same time, a day shared with our ancestors, and topped off with Grandma’s Strawberry Shortcake. Alas! I don’t have Grandma’s recipe for this cake, but I can remember it as if I watched her make it yesterday. From this little flicker of memory, I created this cake, trying to be as true to Grandma’s version as possible, including the fact that the cake seemed to be somewhere between a yellow cake and a white cake, with just a hint of color; I call it Creamy White Shortcake. As I assembled the cake for this post, I looked out my kitchen window and saw that the peonies are starting to bloom: pinks, reds, and creamy white. For me, strawberries and peonies will forever be linked because of my grandmother. In 2015, the local strawberries are ripening at the same time the peonies bloom, just like they did when I was ten years old and helped Grandma make Strawberry Shortcake for Decoration Day. 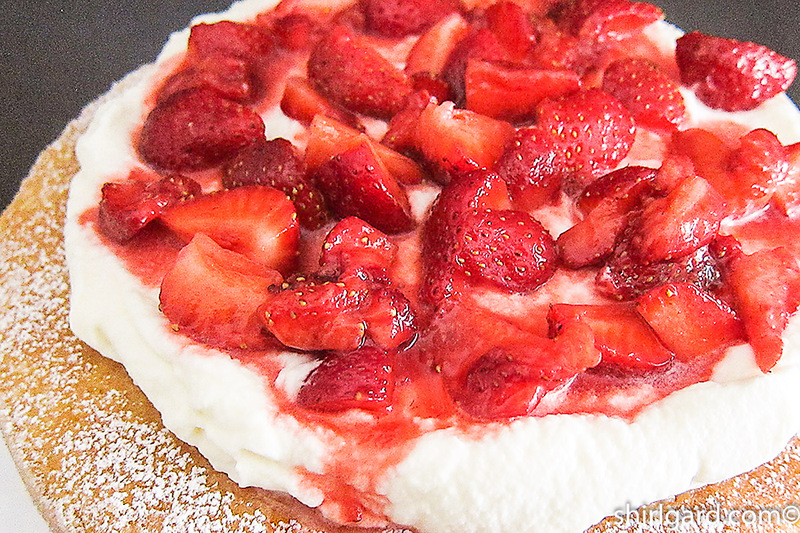 There are many different recipes, versions, and images that fall under the umbrella of Strawberry Shortcake. 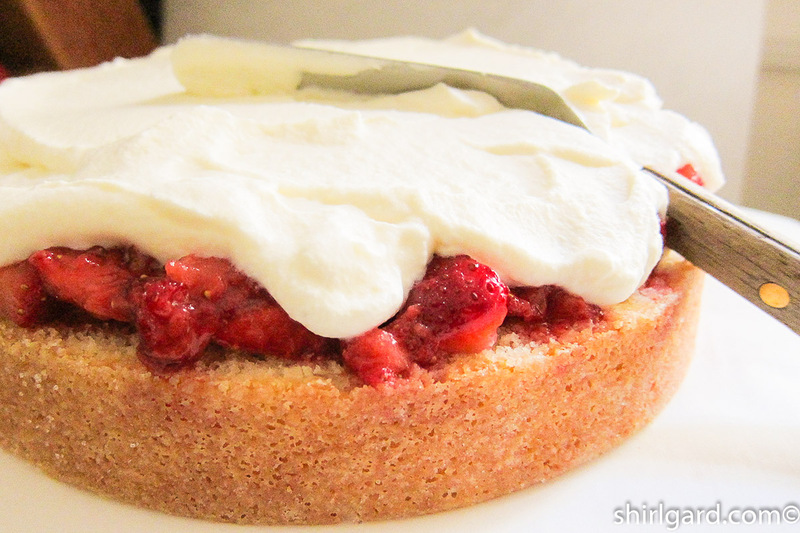 Grandma’s is a cake-style Strawberry Shortcake, unlike so many others out there that are individual biscuit-style shortcakes, epitomized by the classic James Beard Strawberry Shortcakes. What kind of Strawberry Shortcake did you grow up with? I would love to hear from you about how you define this iconic American dessert. Baked shortcake ready for splitting & filling. Slicing the Cake into two Layers with a Wilton Cake Level (Grandma eye-balled it and sliced it with a knife. 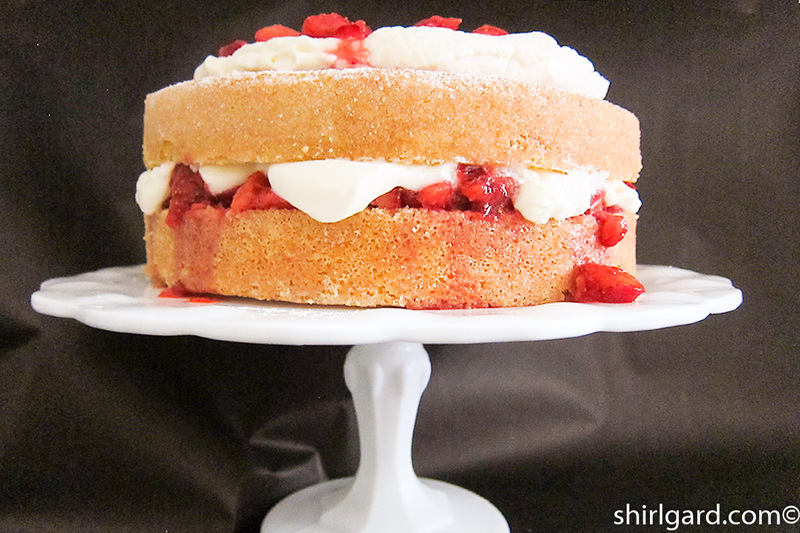 A dramatic Strawberry Shortcake presented on a cake stand is the epitome of a summer dessert. 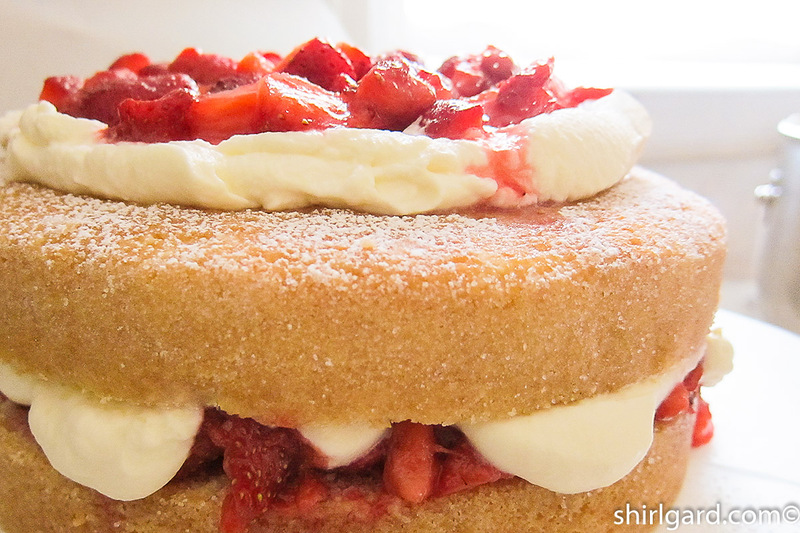 This recipe, created from my memory of Grandma Anderson's cake-style Strawberry Shortcake, is assembled in luscious layers of creamy white cake, fresh strawberries, and whipped cream, just like Grandma did. 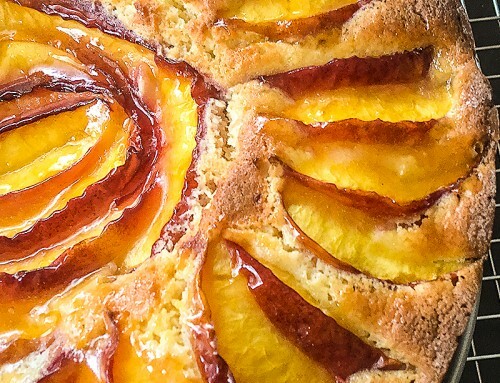 TO BAKE THE CAKE: PREP PAN - Spray with Pam. 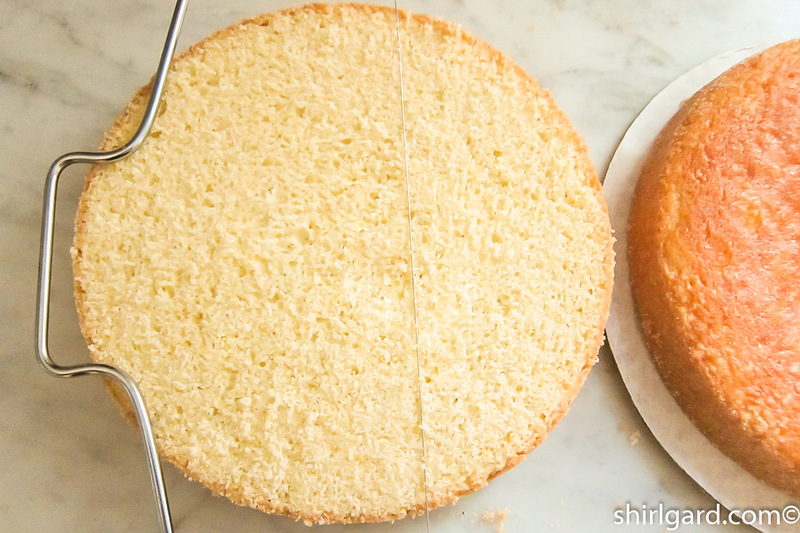 Line the bottom of an 8" diameter x 2½" deep round cake pan with a parchment round. Brush parchment and insides of the pan with soft butter and dust with sugar. On medium speed, add the eggs a little at a time until incorporated, then the sour cream, milk, zests, and vanilla, scraping down the bowl as needed. Mix well. The mixture may look a little curdled at this point, especially if the dairy ingredients are not at rook temperature. 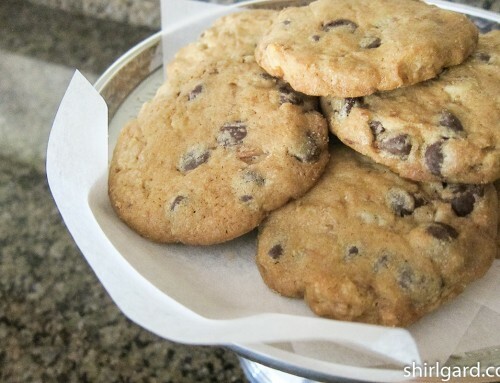 The batter will smooth out when the flour mixture is added. BAKE: At 325º F (163°C) for about 55 minutes, or until golden brown and the sides of the cake start to pull away from the pan. Do not test with a cake tester or wooden skewer until the cake is almost done. Doing so too soon will cause the cake to deflate in the center. 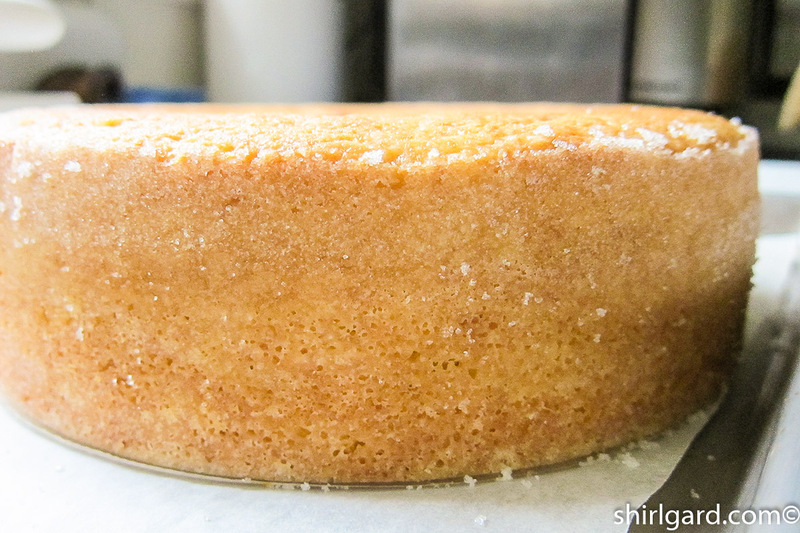 Wait to do this doneness test until the center of the cake looks completely puffed. Cool in pan about 10 minutes. Unmold while still warm, and place on parchment lined sheet pan to finish cooling. Refrigerate the cake so that it is cold before filling; it will be more stable if chilled. 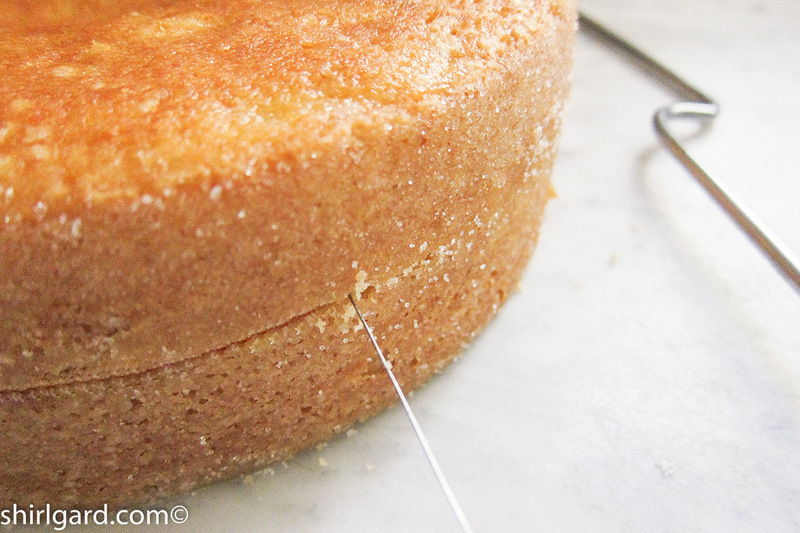 When cold, split the cake in half horizontally, using a cake leveler or a serrated knife. STRAWBERRY FILLING: Divide the strawberries in half. 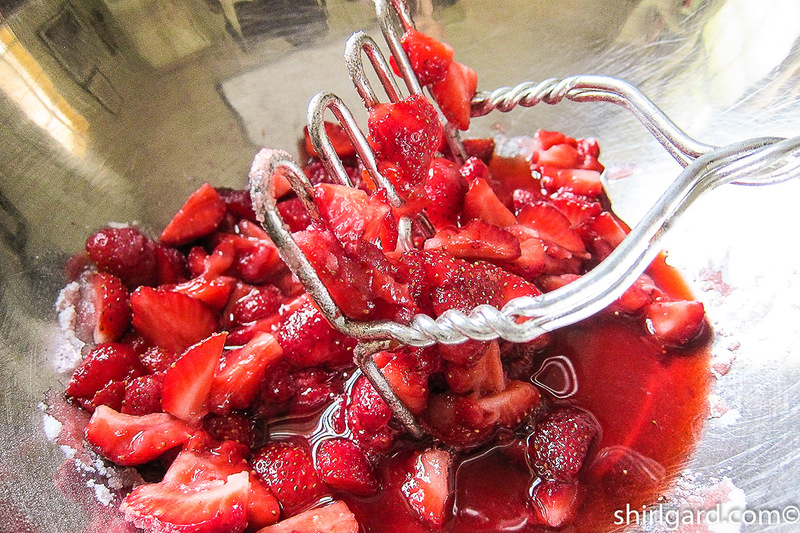 Crush half the strawberries with a fork or a potato masher and stir in the 60g sugar. Leave the other half as is, in quarters. WHIPPED CREAM: Whip cream softly in Kitchen Aid, using the whisk. Stop when you can start to see marks in the cream. It's easy to overwhip. Finish whipping by hand with a whisk. 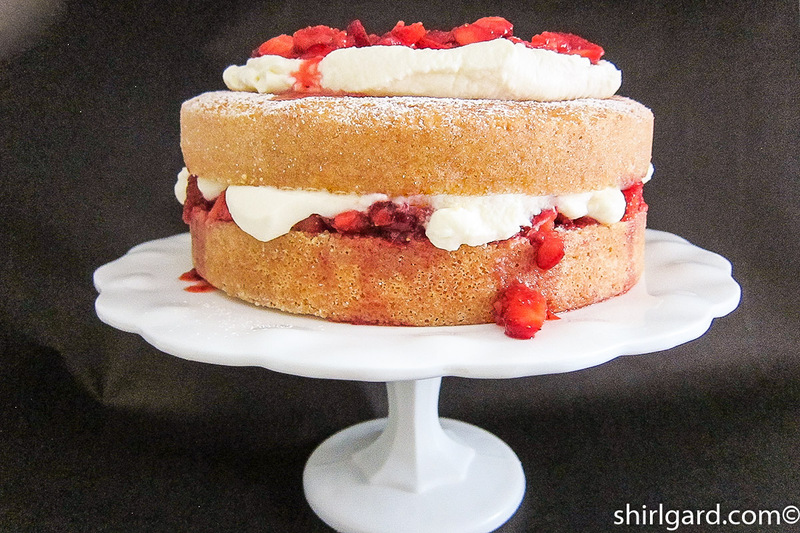 ASSEMBLE THE SHORTCAKE: Place the bottom layer of cake on a platter or cake stand. Place strips of parchment paper around the cake to catch drips. 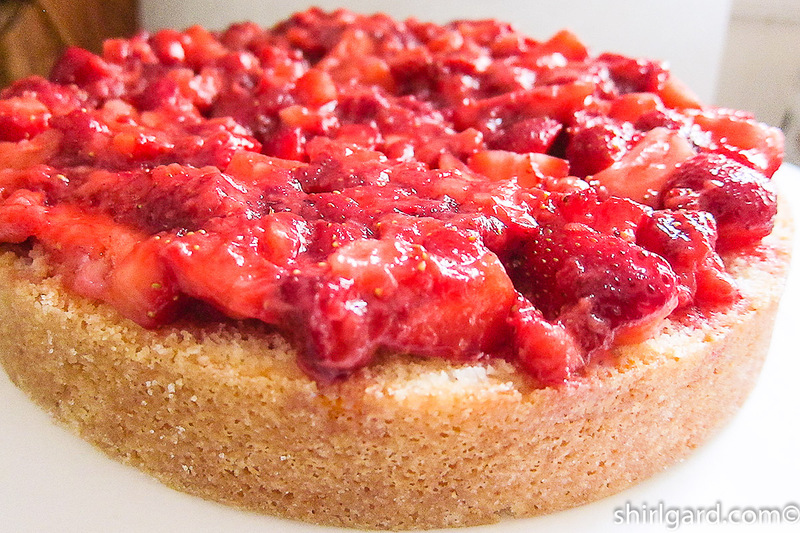 Scatter about ⅔ of the quartered strawberries over the cake and spoon on about ⅔ of the crushed strawberries. Place dollops of whipped cream (using about ⅔ of the cream) and spread a thick layer of cream over the strawberries allowing some of it to slightly ooze over the edge. 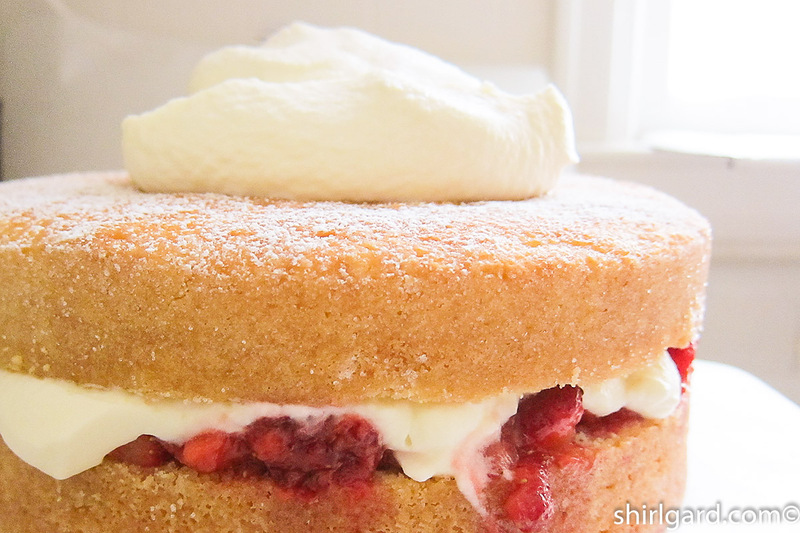 Place the top layer of cake on the whipped cream. Dust the top of the cake with powdered sugar. Again, place big dollops of whipped cream on top of the cake. Scatter the rest of the strawberries over the cream and drizzle with crushed strawberries. If a little drips over the sides, it's OK Pull out the parchment strips and discard. 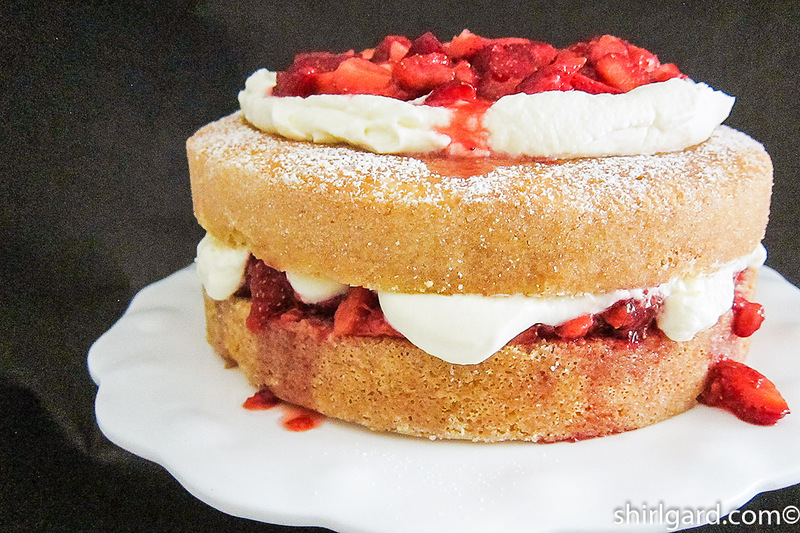 Shortcake filled with fresh berries and whipped cream is best served the same day, but the cake can be made ahead to save time on serving day. IF MAKING AHEAD: Freeze first on a quarter sheet pan or large flat plate until frozen then place in a large plastic bag and keep frozen until needed. This cake freezes well. 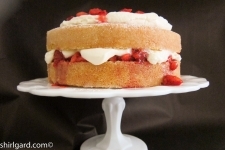 If desired, or short on time, leave the cake whole and cut in wedges: Serve the fresh strawberries on the side with dollops of whipped cream. 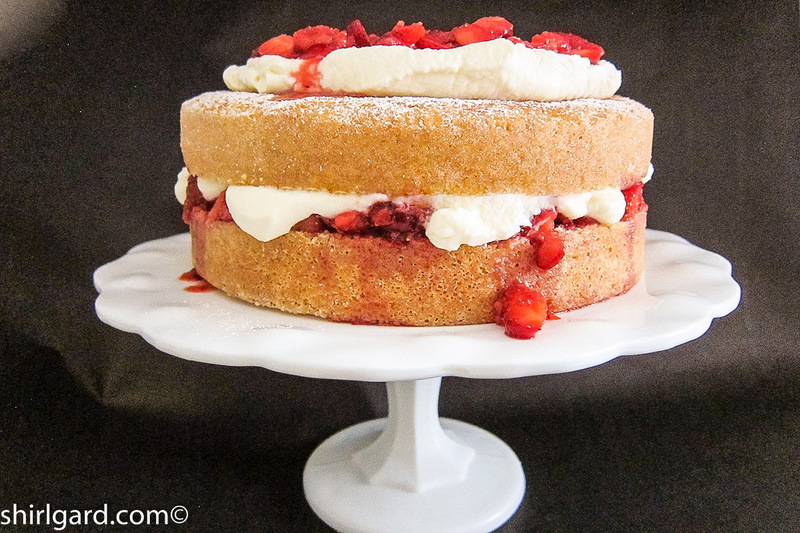 This recipe was inspired by and loosely adapted from "Strawberry Country Cake" in Ina Garten's "Barefoot Contessa Parties!" (2001). Of all the strawberry shortcake photographs that I've ever seen, the one in this book is the one that most reminds me of what my grandmother's strawberry shortcake looked like.